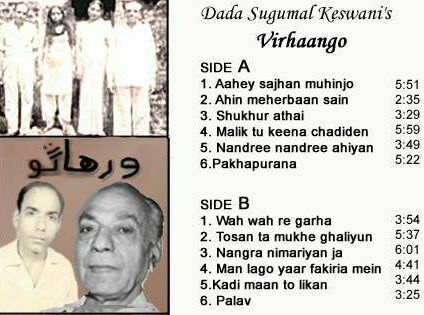 Download Sindhi Songs sung by Dada Sugumal Keswani for free. Dada Sugumal Keswani is having the touch of Master Chander in his voice and gives the similar depth to pain to the words. Virhango album consists of songs which worship the God, expresses pain about the separation, Excitment, Carnival. Listening these songs will surely put you in old days of sindh. This album consists of pure voice and no music. This gives clear listening of lyrics. It is ideal for the sindhis who are away from the native land and who find it difficult to understand the lyrics along with the music. > I suggest that the site may show some typical words of sindhi along with their meaning(may be a word daily) for our childrens so that they may increase the knowledge of sindhi i.e. kulf-lock etc. > Wish we all Sindhis had an own province where our language, culture, respect for eiders & imparting education to children could hv been shared. Though spread all over the world, let us be proud to be a Sindhi, help our weaker sections, unite and say together Ayo Lal Chav Jhuleelal. Share & care. > tavha sindhia ja alphabets ta dina tava par vovels kithe aahen, agar vovels alphabets me hi gadiyal aahen ta maherbaani kare unan khe alag saan darshaindav ta sutho thindo disan vaaran je laahe.